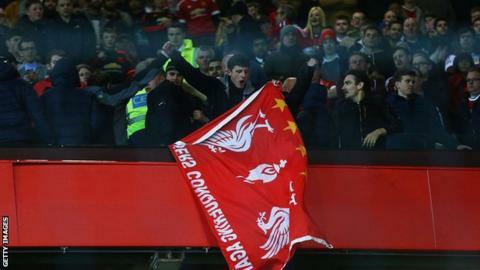 Liverpool and Manchester United have been fined by Uefa for illicit chants during their Europa League last-16 tie. Both clubs have also been punished for the throwing of objects by fans and crowd disturbances, with United fined £44,342 and Liverpool £43,577. Liverpool have also been sanctioned for setting off fireworks and a late kick-off, while United were charged for stairways blocked at their stadium. The Anfield side must also pay for damage caused by fans at Old Trafford. Both clubs' fines include £15,290 suspended for two years. Rival fans were seen fighting in the stands, seats were thrown and flares were lit during the 1-1 second-leg draw at Old Trafford, during which five men were arrested. Some fans of both clubs sang songs related to tragedies involving the other side as Liverpool won the tie 3-1 on aggregate. Europe's governing body was made aware of the allegations of chanting about the Munich disaster and the Hillsborough tragedy. In 1958, eight United players were among 23 people who died after their plane caught fire and crashed in Munich. The Hillsborough tragedy saw 96 Liverpool fans die at an FA Cup semi-final tie with Nottingham Forest in 1989. Before the second leg, police had to remove a banner on the M602 motorway in Salford designed to taunt Liverpool fans heading to Old Trafford.